Ok. I have a confession. I have never seen Mad Men. Can you even believe it??!! I should be ashamed! Especially considering how midcentury design from the 1960s to early ’70s is pretty much my favorite thing ever, it seems like probably the perfect show for me. Even having never seen the show, though, I’ve spent a lot of time looking at pictures of the sets, and of course the clothes, that Mad Men is famous for, so when online marketplace Chairish asked if I could create a Mad Men-inspired room using their collection of midcentury furniture, in honor of the show’s last season, I jumped at the opportunity. 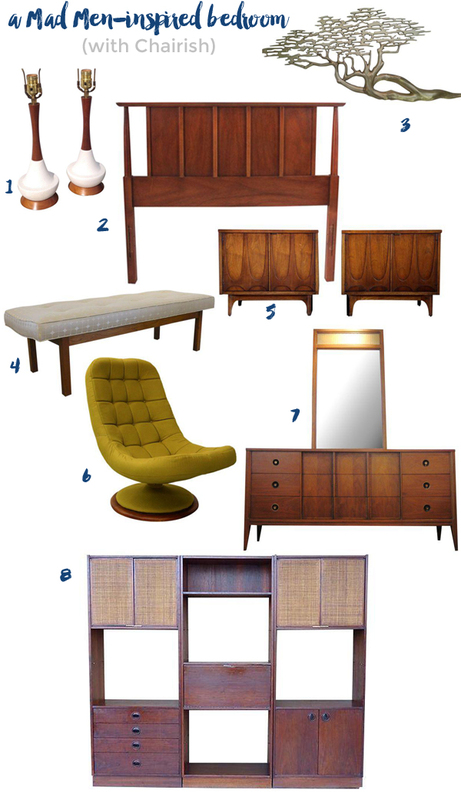 Chairish is an exclusive, curator-approved, online marketplace for vintage and used furniture. I could spend hours looking through their collection, which has everything from high-end antiques to newer, slightly used pieces in every style imaginable, and we actually sold some furniture ourselves just two weeks ago on the site! I decided to set up a bedroom inspired by Don and Megan Draper’s in their Manhattan penthouse. I love the clean lines of their walnut dresser, nightstands and headboard. Plus that floor-to-ceiling storage piece with the TV inserted is a-maz-ing. With a different bedspread and wall color, this is pretty much exactly a room that I could see me and Andy having in our own home. The best part, though, is it’s actually totally easy to recreate the look of this room just by shopping on Chairish! I’m totally obsessed with that chair!! Go check out Chairish for yourself, and you’re sure to find something that inspires you, no matter what your style… Meanwhile, I’m going to go binge watch Mad Men!